The M4 Screwdriver, though small, uses much of the same technology that is found in its upper class mates, including the RedLink electronic intelligence system, Red Lithium batteries and more. A 2-speed gearbox offers speeds of 200 and 600 RPM and a peak torque of 44 in-lbs. 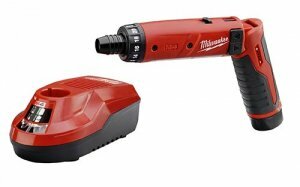 Milwaukee says that the M4 Screwdriver can drill more than 200 holes on a single charge thanks to the Red Lithium 2.0 batteries.